"People come here to fulfill their dreams." 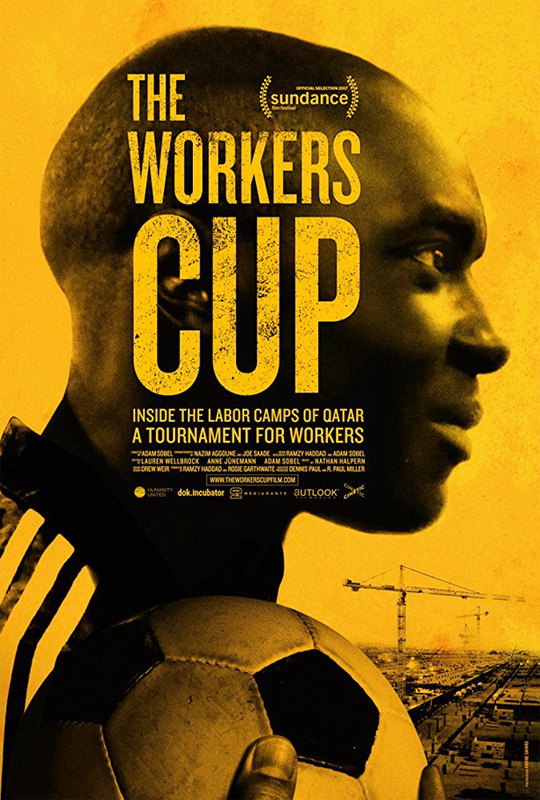 Passion River Films has debuted their official US trailer for a documentary titled The Workers Cup, which premiered at the Sundance Film Festival last year (in 2017) and went on to play at tons of festivals all over the world including CPH:DOX and the Zurich Film Festival. From director Adam Sobel, who spent years in Qatar getting footage, the film profiles the construction of the venues that Qatar is building for the World Cup in 2022. "Inside Qatar's labor camps, African and Asian migrant workers building the facilities of the 2022 World Cup compete in a football tournament of their own." What most people don't know, is that these migrant workers are dying by the dozens (source) trying to complete these facilities, living in terrible conditions - but they still strive on in love for the sport and a desire to contribute something to the world through their hard labor. This doc looks like it's worth our time. In 2022 Qatar will host the biggest sporting event in the world - the FIFA World Cup. But right now, far away from the bright lights, star athletes and adoring fans, migrant workers from Africa and Asia toil exceedingly long hours for scant salaries, and live isolated in labor camps which are by law kept outside city limits. By day they sweat to build the World Cup, but at night they compete in the “workers welfare” football tournament, playing in the same stadiums that will one day host the world’s greatest players. The film follows one team of men from Nepal, India, Ghana, and Kenya whose only common ground is their love for football. Each match offers them a momentary escape from the homesickness and isolation they endure as the lowest class in the world’s richest country. Over the course of the tournament the men alternate between two startling extremes: they play heroes on the football pitch - but are the lowest members of society off the field. The Workers Cup explores universal themes of ambition, aspiration and masculinity, as we see the men wrangle hope, meaning, and opportunity out of dismal circumstances. The Workers Cup is directed by American filmmaker Adam Sobel, who spent 5 years in Qatar, now making his feature directorial debut. This premiered at the Sundance Film Festival last year and played at many other festivals throughout the year. The doc will be released in select US theaters starting June 8th this summer.